Wash tuver dal and pressure cook it for three whistles. Cool and remove the dal. Heat oil and ghee in a pot, then put cloves and cinnamon and then add mustard leaves. When they crackle add curry leaves, green chilies and a pinch of asafetida. Pour tover dal. Mix tamarind and brown sugar water, cashew nuts, groundnut, garam masala, red chili powder and mix well. Add tomato pulp, turmeric powder, salt and 2 cups of water. Boil the dal. roll out big rotis and cut them into pieces and add these pieces in boiling dal. Boil for 10 minutes and remove. 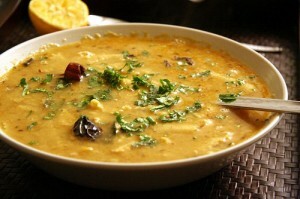 Serve the dal dhokli warm. Sprinkle cilantro leaves.